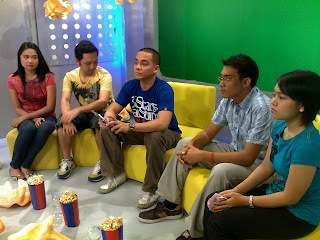 I was invited a week ago by a friend who’s now working with Channel [V] for a guesting in Popkorn, the newest show on TV that caters to pop culture. I was told that my segment is regarding social networks. Since I was one of those who are heavy users of Facebook, Twitter, Plurk and other social network sites, they asked me if I can be on their show. I said, YES! After the YSpeak audience guesting (aired on Studio 23), SM Marikina WiFi event and LetsGoSago Surfing Event in La Union (aired on Qtube on QTV-11) and on ANC’s Leadership Forum (aired on ABS-CBN and ANC) where cameras where able to capture my presence on their show, I truly wanted to be on TV (though I am not photogenic). It was just a dream but this time, it’s for real! I went to Makisig Network, the network that handles Popkorn on Channel [V] Philippines, last Wednesday around 10am for the profile shoot and the program shooting itself. After getting some make-up to cover my facial pores and eye bags, I was off to the studio for my guesting. I felt so nervous for this is going to be my first time that’s why I chatted to some of the staff there including Ma’am Corine(? ), their segment producer, to boost some confidence. Good thing it was like a usual discussion, conversation between friends. But I could not deny that I still feel awkward about my voice that day (series of overnight session due to our defense in school plus my work load in Convergys) and somehow, due to nervousness. 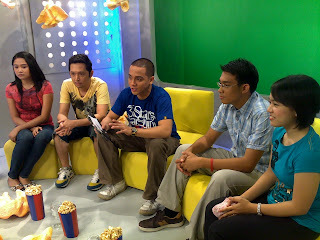 The host for that segment was VJ Mondo (the one in the center). If you’re a fan of NU107, he’s one of the DJ’s in that station. 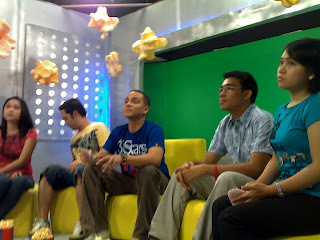 Yes, I’m inviting you guys to watch Popkorn on September 18, 2009, Friday, 9PM on Channel [V] Philippines! I will not be able to watch it since I have work that time. Hopefully you can watch it for me. Hehehe. Thanks thanks! When I was in the dressing room, I saw Direk Jose Javier Reyes and wonders if he’s part of the show. After doing some research, I found out that he’s the creative consultant of Channel [V] Philippines. No wonder they’ve got cool new shows line up. 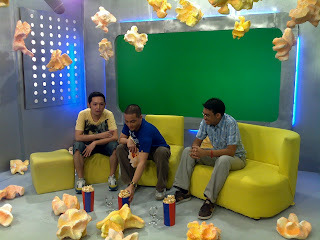 Specially thanks to Nino for inviting to be their guest on the show. So much appreciated! Super thanks!